Bullion American Silver Eagles demand was exceptionally strong in October, pushing sales to the highest monthly total of the year and the fourth best ever in the history of the program. Conversely, silver prices continued a downward spiral in October to a new four and a half year low that was punctuated by significant losses during the last week. For October, silver futures recorded a decline in prices of 5.6% following a 6.3% weekly drop. Silver for December delivery closed the month on Friday at $16.11 an ounce, actually recovering from earlier trading in the day which bottomed at $15.64. Silver prices have plunged 16.9% in the year to date. Across the Atlantic, precious metal prices in London had similar results with silver posting a 5.3% decline in October as it shed $0.91 in the period. Silver had a fix on the 31st of $16.20 an ounce. It has fallen 16.9% on the year so far. Year-to date finds gold at -3.1%, palladium up 10.3% and platinum down 9.7%. As mentioned, demand for bullion American Silver Eagles was robust in October with sales at their highest monthly total of the year. For the month, the United States Mint recorded total bullion Silver Eagle sales at 5,790,000. 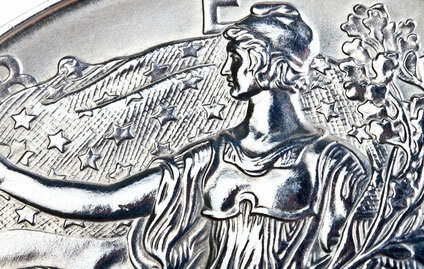 Year-to-date, the U.S. Mint has recorded bullion American Silver Eagle sales of 38,041,000. At that level, 2014 already qualifies as the third best year ever for the program, coming behind 2011 and the all-time record set last year. For reference, 2013 sales through October were at 39,175,000. America the Beautiful Five Ounce Silver Bullion Coin advanced 5,100 in October, not one of the best months this year but then no new issues were released. This increase is most surprising due to the fact that no new releases were issued in the month. The last 2014 America the Beautiful Five Ounce Silver Bullion Coin, honoring Everglades National Park, is scheduled to be released on Monday, November 3. As the price of silver continues to drop, so does the associated melt value of silver coins. This is exemplified by the chart below which offers the melt values of common U.S. silver coins which many investors and collectors hold for their compositions of silver. The table above uses the London Fix for silver at the end of September and October to create the comparisons.